What makes a setting work for D&D? A while back on Dreams in the Lich House, there was a couple of posts (here and here) regarding what makes a D&D setting good in terms of playability. Although there was some disagreement over which elements count as core and essential to the game, no one has offered a better treatment yet (regardless of what exactly "better" is supposed to mean in this context). Assuming there exist a number of criteria which absolutely have to be satisfied, we can find the core elements of a D&D setting by analysing how adventures are generally set up, what elements they include (locations, items, etc. ), and how they relate to the player characters' actions. Note: This session report is an edited version of the one posted at http://land-of-nod.forumatic.com. We finally kicked off our long-awaited Land of Nod campaign. After a short introduction to the setting and the rules (OD&D with a few tweaks), four characters and their followers were set loose in Ophir, looking for trouble. I must admit, I improvised all of what happened on the fly (I wanted to prevent creating stuff in vain, plus I have started my best campaigns with a completely improvised session earlier, so it seemed reasonable it may also be accomplished with a pretty rules-light game, too). Note: This is a reposting of a review from Dragonsfoot with minor editing. The Valley of the Hawks is only but the first instalment of the Hex Crawl Chronicles, a series describing different sub-settings (based on certain North American areas, according to the author). It is published by Frog God Games and written by John M. Stater (of whose NOD magazine both Melan and Bryce Lynch wrote a review). It uses the Swords & Wizardry Complete rules, but can be used with any old school D&D-esque system (for those who are interested: a Pathfinder version is also available). 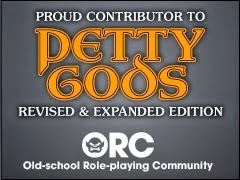 Greetings everyone and welcome to this yet another OSR blog! Creating and maintaining this blog is actually one of my new year's resolutions (gaming-relevant ones are to be discussed here); I suppose three posts per month seems to be a good lower limit, so expect at least that many.